A quick post and run here. This went out in the mail last week in time for our Peanut to have his First Birthday portraits done. If you didn't know, First Birthday parties have become a big deal. Big Deal! Peanut's party is a Mr. McGregor's Garden theme with full on Peter Rabbit in all its forms. 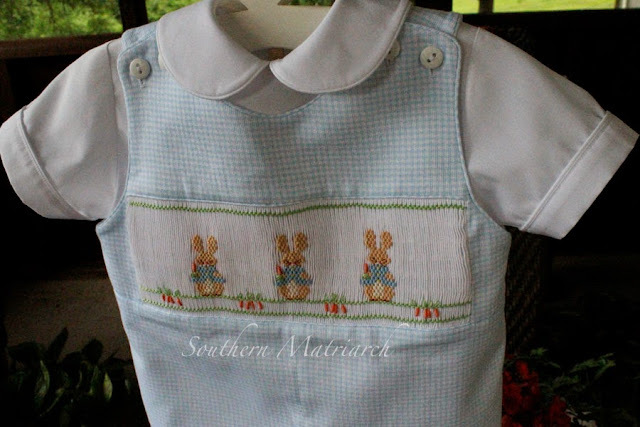 Gwen Milner has revised her original Peter Cottontail smocking plate and that is what Peanut's Momma chose for his birthday outfit. It was featured in Issue #152, available here. 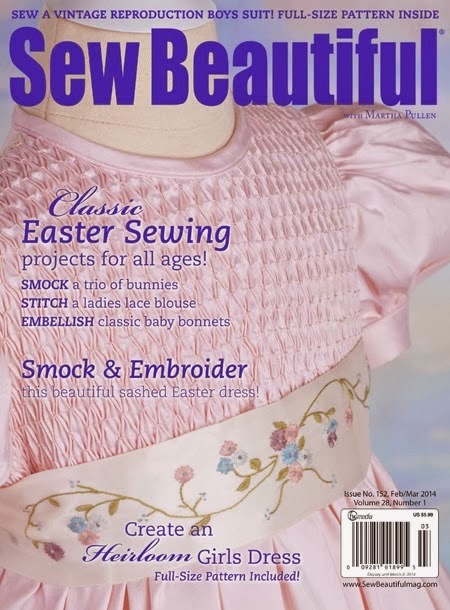 The fabric came from Farmhouse Fabrics. It is luscious! I wish I had it in every color. It is a gingham pique. Luscious I tell you. This picture doesn't do it justice. A dream to work with, even if the seam allowances are ironed into the front for everything they are worth. The shirt is plain Imperial Broadcloth. My border rows were straight until I inserted them into the front. Now they are wavy as all get out. Shoot. Oh well. 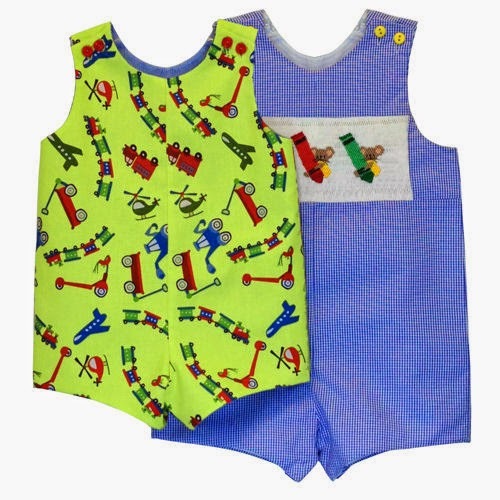 The pattern used was Children's Corner "Johnny". If you don't have it, I suggest you get it. Goes together in a flash. This is the first of two I did in the past couple of weeks. More on that next time. It is hard to believe it is his first birthday. Time flies. 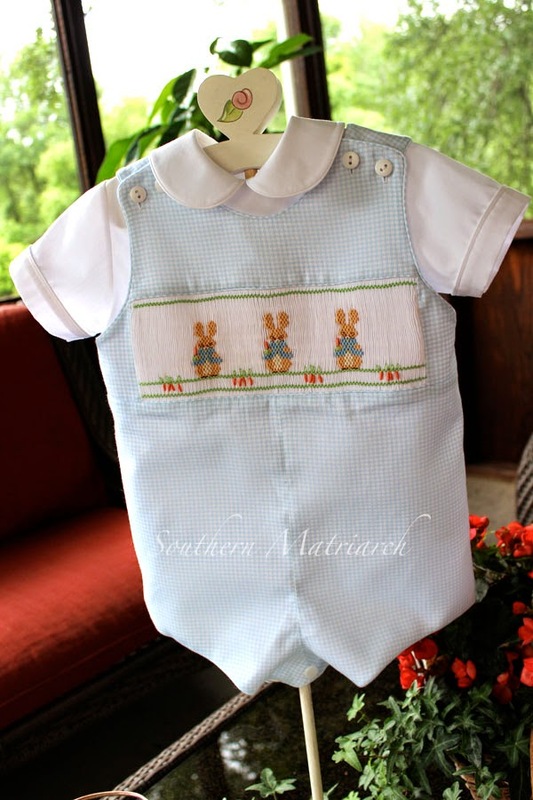 Perfect Peter Rabbit for your little Peanut! Those ironed seams probably show up more in photographs, than in real life. He will be so handsome in it! I love reading your blog. Can you tell me if that pattern has snaps in the crotch? 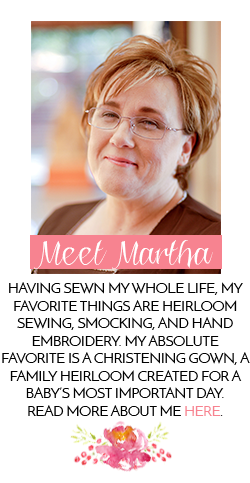 Hi Martha! Do you make and sell these beautiful jon jons? I would love to purchase one for our baby boy if so. Thank you!